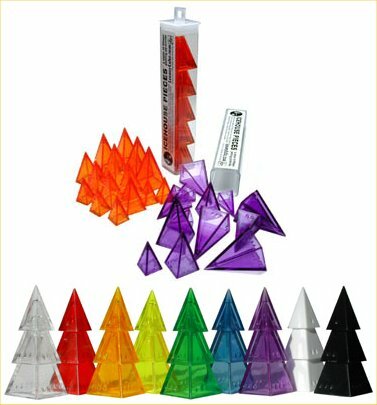 The Icehouse set, winner of the Origins Award for Best Abstract Strategy Game of 2000, is now available divided into individual "stashes" so each gamer can choose whichever colors they want for their set, or supplement an existing set with the extra colors they have been looking forward to. Resilient square plastic tubes with 15 stackable, nestable pieces in three sizes of a given color. Available in red, yellow, green, blue, clear, black, and all new purple, orange, and opaque white! Other products in the "Icehouse" series. These pieces are the best items in my entire collection... to a deserted island, I'd definitely bring along these versatile little pieces as my only entertainment.